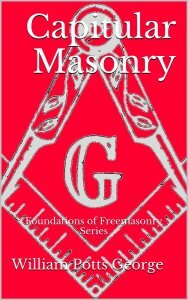 Capitular Masonry is the second stage or section in the Masonic progress of the York Rite. It suffers often, and is frequently too lightly esteemed as an intermediate series of degrees between Blue Lodge Masonry and the Templar Orders of the Commandery. But, it is full of meaning and contains within itself lessons fully as important as can anywhere be found. In this essay, Brother George guides us through the story of these degrees and helps shed light on their importance to us, and our personal temple.